I recently saw some older posts about retail WoW talking about some weapon size nerf/buffs to races. Seems that Female Blood Elf had their weapon size increased and Female Humans had their weapon size decreased. 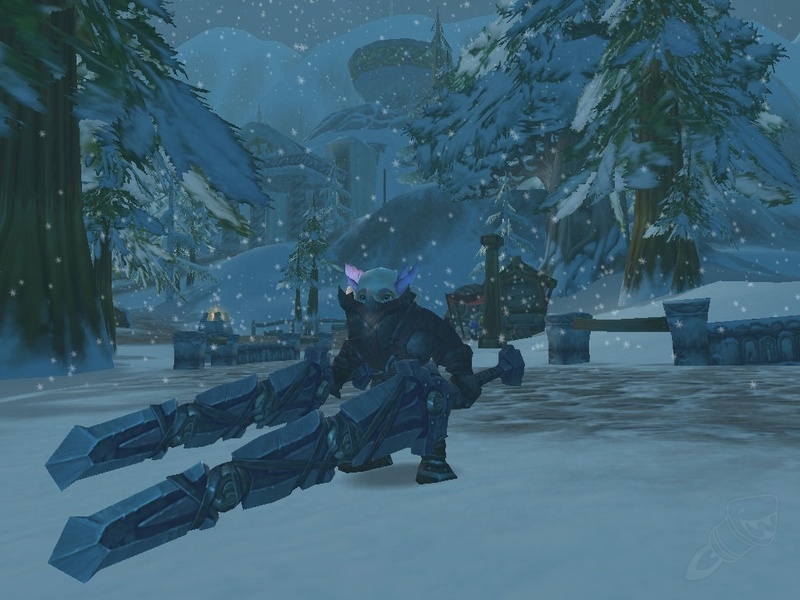 It made me wonder, which race had the largest weapons to character size in vanilla WoW? From slightly reading about it, it seems that Human Females or maybe Gnomes had the largest weapons based on their size. Does anyone remember or have any pictures to show who had the largest weapons? Do you know what patch it was that the post was talking about? Then again as we learned from the German interview memories can be deceiving! Human Female weapon sizes were ridiculous. I remember Maladath, which was already a large sword, being gigantic on them. From what I read it looks like Blood Elf females and Human females had their weapon model sizes changed in patch 7.2. At least based on what was being discussed in these threads here. It seems they increased the Blood Elf female weapon size when implementing the updated models. Also, after reading a bit more it seems as far as Human females goes, the increase in weapon size, while unsheathing, was a bug introduced in WotLK. So, I am still unsure about race weapon size comparisons in Vanilla WoW. Hahaha I do remember that. All those Orcs on the forums were so up in arms about that. I do recall laughing to myself whenever I saw this gnome with Thunderfury on his back during Vanilla. Always thought it looked goofy. As a side note, I have always had a preference to the different races using their own mounts. For instance, a Tauren on a mechanostrider looks a bit ridiculous. The way I see it, Blizzard modeled Humans to ride horses, Night Elves to ride tigers/sabers, etc, etc. Yes we can deviate, but the aesthetics aren't as pleasing, IMO! Eh I dno, that kind of wonkyness and quirkiness I find quite endearing and I won’t be too bothered by weapon sizes/mounts etc in Classic. @Edensong, everyone looks boss on a tiger though. And for the longest time the only thing I wanted for my orc warrior was a black war kodo. It felt amazing the day I finished grinding for that! @Hogbobson Yeah tigers are pretty cool. I was just reading teebling's guide to attaining the Winterspring Frostsaber (btw thanks dude, sweet guide!). Now I'm thinking of farming it as I would reap the rep benefits as a Human. Anyways, back to weapons, here is what I was talking about. Weapon sizes on Gnomes was definitely the silliest! Jokes aside never knew of this, that gnome image is so darn cool! Orcs have BiS shoulder size! This is a place to help teebling gather feedback about the site.